Colin juggles his three children, running a photography business and working regularly as a substitute teacher. 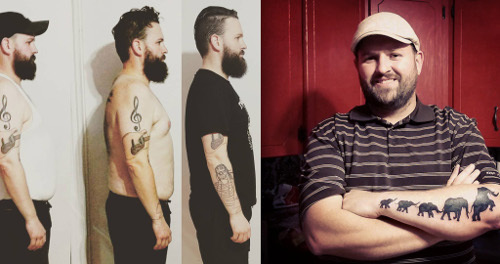 He spent years dieting, losing, and then regaining the weight he'd lost. He learned about a plant-based diet after photographing food for a plant-based doctor. "Hey there, just wanted to let you know how glad I am that I've found your site. I started a whole food plant based diet back in September 2015 and have lost 25+lbs. since then. I have more energy than ever, have started playing sports again, and feel younger than I did 15 years ago. PS. I'm also a lover of elephants...I have 5 elephant silhouettes tattooed on my forearm to represent my wife and I with our 3 sons." I asked him if he would be willing to share more about his story as part of the Herbie of the Week series. Thankfully, he said yes! HH: Tell me a little about yourself. My name is Colin Pittman and I live a very hectic life. I run a photography business (Colin Pittman Photography), I'm a substitute elementary school teacher, and father to 3 amazing boys aged 8, 6, and 1. 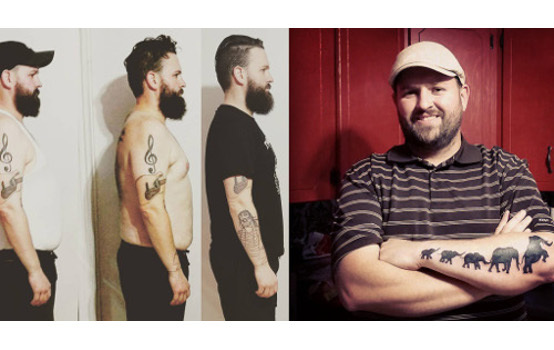 I have long struggled with weight fluctuation...my weight ranging from a manageable 180 lbs. to a whopping 265 lbs. I've lost 85 lbs., 50 lbs., and 37 lbs. on separate occasions always rebounding back up higher than before. I needed something long-term that was not a fad diet...no more calorie counting and cutting carbs. What kind of dietary changes did you make? I was up to 240 lbs. in April 2015 and found that it was impacting my ability to work...the way in which I photograph children requires a lot of kneeling, lying down, and leaning over. I decided to start exercising more and hired a personal trainer. I also started to eat better, cutting out junk food and drinking more water. I immediately started seeing results but began to plateau after 6 weeks or so. HH: How did you learn about a plant-based diet? This is when a doctor asked me to help him out with a website he was developing which focuses on whole food plant-based lifestyle benefits and provides recipes to help people realize that the foods can be both delicious and filling. He needed photos of each dish he prepared in order to entice viewers so I obliged. After photographing each dish, there were plenty leftovers so I would bring along the family and we would try each dish and chat with the doctor about the benefits. Come September we were almost entirely plant-based and oil free. HH: Have you noticed any changes in your health since you started eating plant-based? Since then I've dropped to 190 lbs., I now play ice hockey in a community league, I am more flexible and able to perform my job so much better. I haven't been bloated in months and I feel healthier than I have in 15 years. HH: Has your family faced any challenges with the lifestyle transition? There have been some challenges to the lifestyle changes we've made, like trying to get our two older kids on board, but it's totally worth it and they are now enjoying it...though they still like a scattered treat from Nanny. Thank you so much Colin for sharing your plant-based journey with us!